Convenient, portable and a highly visible education tool, article reprints (professionally produced copies of journal articles) are a very effective way to educate and disseminate research to your target audiences. 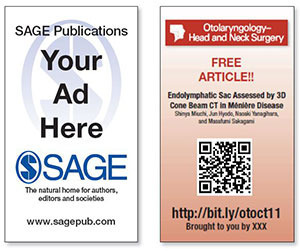 Article reprints from SAGE’s portfolio of respected peer-reviewed journals discussing products, therapies or topics related to your company can be provided online, in print, and translated into a local language for a key market. Collated articles reprint (a selection of relevant articles reprinted together). With a number of printers and distributors at our disposal we are able to offer a timely and cost-effective delivery service to ensure reprints are delivered according to your requirements. Add customer value with a Pocket Article Card at your next conference or customer event. This handy business card is a convenient way to brand your company and website whilst also providing industry knowledge to your customers with access to a free article on a specific topic pertinent to your business and product line. QR Code and URL linking to the sponsored article. Partner with us to produce local language reprints of selected journal articles in the geographic region of your choice. In keeping with the rapidly evolving world of reprint usage and dissemination, we offer a number of electronic reprint (or e-print) options to suit your needs. Benefitting from faster delivery and the ability to monitor usage, e-prints are quickly becoming an invaluable tool in marketing key products. Give your customers immediate access to articles online through e-access links posted on your website. Choose from 6 months to one year of unlimited access.